Band wagon fans Grid., were they talking smack about the win against us? No, they were a pretty quiet crowd. Sunday's game sold out, and most of the 84,000 fans appeared to be confused, bemused and ultimately enthused. There seemed to be collective puzzlement over the (many) pass interference penalties, the concept of reviewing calls and especially the arrhythmic pacing, as there are no commercial breaks (and, for that matter, few stops in play) in soccer. And there was a sense that the presentational aids -- the "Hip Hop Hooray," the air-canoning of t-shirts, the cheerleaders -- were fun, but took away from the action. The philistines who crack on soccer because of the paucity of scoring had a good laugh today. Think Manchester United scoring two goals in the first 12 minutes of their game Sunday was a heavy offensive output? So How's That Whole NFL-in-the-U.K. Thing Going? What the NFL needs to do imo is bring some marquee matchups to Wembley. 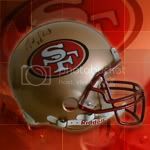 49ers vs. Giants, Packers vs. Bears, Cowboýs-49ers, Jets-Patriots, Ravens-Steelers, Giants-Cowboys and so on. Jags-49ers looks like another blow-out. Having said that, I think the Saints-Chargers and niners-Broncos were pretty good games. Success is temporary, loyalty is forever. Do they not do that because they do not want to pull 2 hugely popular teams out of the country at the same time ie. 49ers vs Giants, Ravens vs Steelers? I don't think either of this marquee matchups willl happen? Neither Ravens nor Steelers would ever accept "home field" in London in that division rivalry? If that were indeed the case Grid., might the Commish. get involved and give them incentive to make that trip ie. maybe each team and it's players get a bonus or maybe an added late round draft pick? Just ideas. I agree but can you imagine if that stadium was filled to capacity with fans of both teams ie. Packers, Vikes, Ravens, Steelers, NINERS, Cowboys? Thing is though prob. only 1/3 would be the actual usa fans from those cities. The rest would be Europeans so it would be much less raucous! lol it's football not soccer T.! It was reported in London that ticket sales would begin after Thanksgiving! I bet our game will sell out fast so hurry up Grid.! Yes don't want to miss out on the river boat cruise fun! Is your pulse down yet, Grid? Any new eye candy from this last trip Grid.? Well, hotel is booked and game tickets are paid for! October 2013 can't come too soon! How about it Grid? Are you set up yet? I didn't think you could buy tickets unless you bought for both games yet......?? I've used them for soccer trips to Barcelona and Chelsea the last couple of yearsrs and everything was fine. Hotels too. It is fairly exspensive I agree but I really wanted sideline tickets at the Club level this time and this was the only way to get that - as far as I know at least. We're staying two nights this time and at the same hotel we used this year for the trip to Chelsea and Stamford Bridge. I hope there's something NFL/49ers related going on the day before the game. I want to meet up with some cheerleaders too!! Managed to get a pair of Upper Sideline (first 20 rows) ones. The guys I normally go with weren't up for watching a blowout, so we also got tickets to the Vikings-Steelers game. Just need to sort the travel and accommodation now.